The basement needs some attention. Scott has been working on repairing the plaster on the wall leading to the basement and installing drywall on the opposite wall. This is one project that I have had nothing to do with (so far). 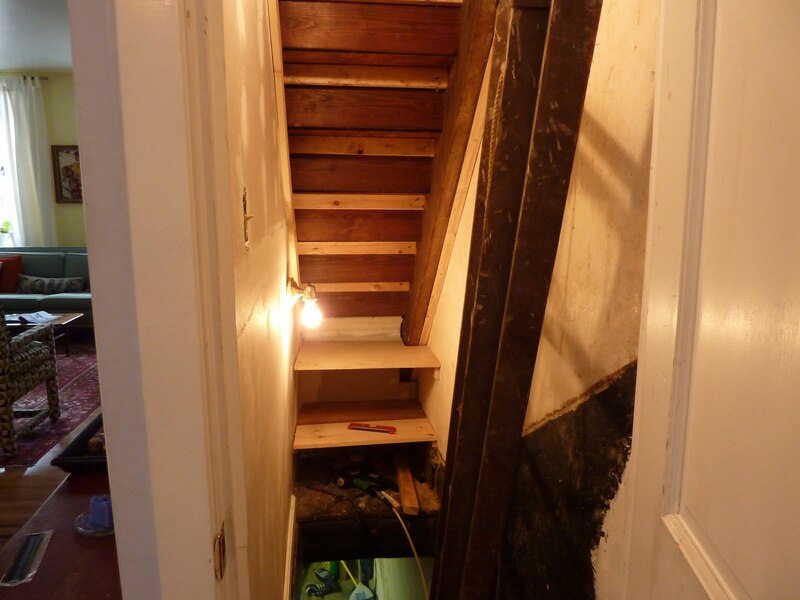 He has also been working on the shelves that we want underneath the stairway. This is what the entryway to the basement looks like right now. It is already a huge improvement from what it used to look like. It had wallpaper (ah yes everything in our house had wallpaper) and it had black paint leading down one side. I want to paint all the walls white, the shelves white and the stairs leading up white. To liven things up a bit I want to paint the stairs leading down to the basement in fuchsia and then seal it. I don’t like going down to the basement but I am sure that if the stairs were fuchsia it will be a much more pleasant journey. We will install hooks to the right of the door to hang mops, brooms, and dustpans. We are going to install some hooks to the left for extra jackets because our vestibule doesn’t hold a lot of jackets, especially when we have guests over. Also, I hate hiding the fabulous Moroccan tiles in the vestibule with jackets! « Sometimes you need to hire professionals.